Academics and professional personnel in the College of Health Sciences participated in a workshop held to discuss how to incorporate health advocacy into the Health Sciences curriculum. 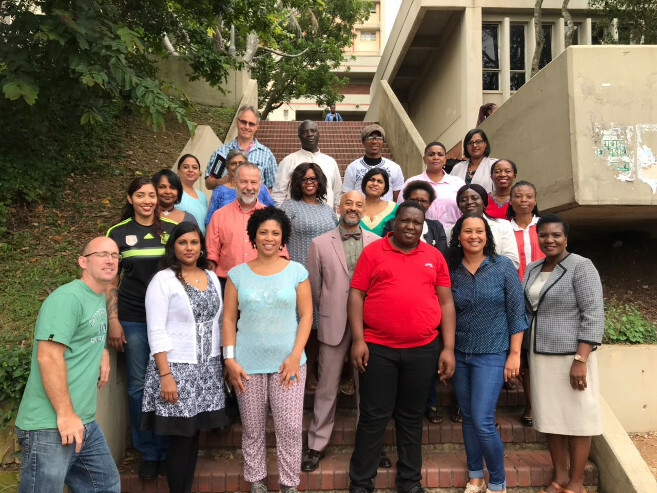 The College of Health Sciences in partnership with the Rural Health Advocacy Project (RHAP), hosted a workshop titled: Incorporating Health Advocacy into the Health Sciences Curriculum. The workshop attracted both academics and professional personnel in the College to debate the importance of incorporating health advocacy in the Health Sciences curriculum and how incorporation could be achieved, as well as the challenges of teaching health advocacy. The Manager of Knowledge Management at RHAP, Ms Samantha Khan-Gillmore, defined advocacy as an active promotion of a cause or principle involving action to change policies and practices, make a broader impact, reform institutions, alter power relations and change attitudes/behaviours. ‘Our experience at RHAP provides evidence that frontline health professionals are requesting advocacy training on a daily basis to deal with current challenges. Students need to learn how to advocate for their patients – in and outside of the clinical environment. Development of knowledge, skills and attitude around advocacy is also very important for future health advocates,’ said Khan-Gillmore. Academic leader at UKZN’s Discipline of Occupational Therapy Ms Chantal Christopher shared a case study on how the Discipline had incorporated advocacy into the curriculum over the years and how the discipline had familiarised itself with the communities it serves by obtaining insight into local cultures and belief systems as these related to the community’s understanding of health and diseases. ‘Through our fourth year community-based module and our ongoing community projects in KwaDabeka, Clermont and Marianridge, we have been able to identify the health needs of individual patients. We have successfully identified opportunities for advocacy, particularly for poor and marginalised societies. We are concerned and act as advocates for patient/ client groups with particular health needs whilst incorporating ethical and human right principles,’ said Christopher. Participants unanimously agreed there was a need for investment in capacity development for teachers to be able to incorporate health advocacy into the curriculum. Create opportunities for dialogue and discussions.